· MasterTrak© operates seamlessly on Windows95™, Windows NT™ Windows98™ and Windows2000™ as well as on Networks using Windows NT™ or Novell Networking. · All applications in MasterTrak© are menu driven providing the user with a simple and direct interface with the various system operations. · MasterTrak© provides a standard user interface for data entry and report printing. This standard interface enables cross training of operators between applications. · Extensive use of dropdown boxes and scan forms to assist the user in entering data into the MasterTrak© applications. · Where applicable, drill-down capabilities exist to assist the user in entering missing data or editing incorrect data. · Extensive edit checking is provided to assure that the operator is entering the appropriate data. · On-line help is provided, both to describe the data fields and to provide procedures to assist the operator in performing required tasks. · Interface with Spreadsheets such as Excel™ using the standard report preparation interface. This enables the data from any report in the system to be transferred to a spreadsheet. · Interface with Word™ and WordPerfect™ word processing systems for the preparation of personalized letters. · The entire system as well as each application and or process may be password controlled to provide security. · The user can exercise control over the output of reports by changing the sort and record selection criteria for each report. · All transaction data is kept at the detail level, with procedures for summarizing provided where appropriate. · Detail reporting with selection criteria for the various fields is available to enable user inquiry into the database. · All transactions are entered and processed by User Batch. This enables multiple users of a given application to control their entries. · The user can use special filtering procedures to find data in a field or table that matches certain criteria. · Direct the output to preview or selected printers. · Enter selection criteria to limit the records being printed. · choose detail or summary presentation. 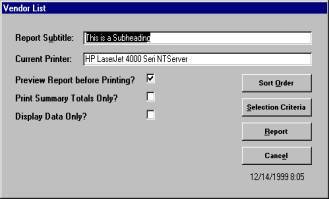 · Assign a subheading note to print on report. · Print summary totals only. · Direct interface to Excel. · Print the selection criteria used on the report. · Each User can save selection criteria as default.